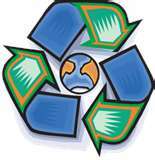 WELCOME TO MY MONEY MISSION ONLINE: RECYCLING...DO YOU OR DON'T YOU? RECYCLING...DO YOU OR DON'T YOU? "Going green"...."ecycle"....."reduce, reuse, recycle"....ahhhh...the "buzz" words of today's society. I know that it is very important to do this. So, if it is so important, why oh why can't my smalltown make it EASIER!!!! Take today, for instance. I have my newspapers all ready to be picked up by our "recycling truck." Now, keep in mind, my smalltown's recycling truck is a pickup truck, driven by smalltown employees, and it is pulling a flatbed thing-a-ma-jig contraption that they load the recycled materials on. I can never, ever remember what Monday they come. I'll put it on my calendar and yet, I always seems to miss the pickup. Today is no exception. I was sitting here, typing away, thinking that next week is the pickup. TODAY was the pickup. I have nothing set out and the truck-with-the-thing-a-ma-jig just goes on by. Now that stuff gets to sit on my concrete-slab-of-a-driveway another 2 weeks. Do any of them work effectively on hard water "soap scum" that sticks like CEMENT to the tub? Until then, have a terrific Monday everyone!! We live very near a parochial school, two elementary schools, a high school, our city hall and the "cat house" (shelter). All of those have paper bins, and the city all and high school also take glass, cans and plastic. However, we usually save cans to go with scrap aluminum and copper Shane is able to get from some of the job sites (with permission) to take to the recycling center for cash in return. I can't remember the last time I bought any commercial cleaners. I use homemade all-purpose cleaner that has ammonia, Dawn, rubbing alcohol and water in it. I use it for almost everything, including my floors, but I use a paste mixture of Dawn and baking soda to get soap scum off the shower and tub. The Dawn cuts the oils and the baking soda is a mild abrasive. A magic eraser works on soap scum, too, but they don't last long. I sometimes make my own laundry detergent. I use vinegar instead of fabric softener (or usually I just don't use anything at all). Shane sometimes uses a dryer sheet, but I don't. My son seems to not be able to "see" the recycling pail - even though it is right next to the trash pail. Every week he puts out the trash, but not the recycling. So weird! I try to do the best I can... But I could always do better! I did do a tag not long ago out of recycled stuff.. It was fun. We recycle everything that we can here. I always yell at the kids that "God likes people that recycle" and for that I get the rolling eyes! I clean with vinegar and hydrogen peroxide but not together! I clean the tub real well and then spray it every day with a mixture of vinegar, water, and a squirt of dish soap. It works pretty well as long as everyone wipes down the shower when they are done.